CIA Director Gina Haspel is headed to Capitol Hill Tuesday morning to brief a limited group of senior senators on the role top Saudi Arabian officials played in the death of journalist Jamal Khashoggi, this according to senior Senate aides with knowledge of the matter. The chairmen and top Democrats on key national security panels - Armed Services, Foreign Relations, Intelligence and the Foreign Operations Subcommittee of the Appropriations Committee - will meet Haspel behind closed doors in the secure room of the Capitol, the aides said. It was not clear why the group was limited to just eight senators. "I think it would have been good to have the full Senate," said Bob Corker, chairman of the Committee on Foreign Relations. When asked why it was limited, Corker said, "I don't know." Haspel's appearance comes one week after her absence at an all-senators' classified briefing on the matter touched off a firestorm in the Capitol. Senators on both sides were furious, blaming the White House for holding Haspel back, with one normally-staunch Trump ally, Lindsey Graham of South Carolina, threatening to hold up an end-of-year government spending bill until he received a CIA briefing on the journalist's murder. The White House and CIA denied that the director was handcuffed from attending. 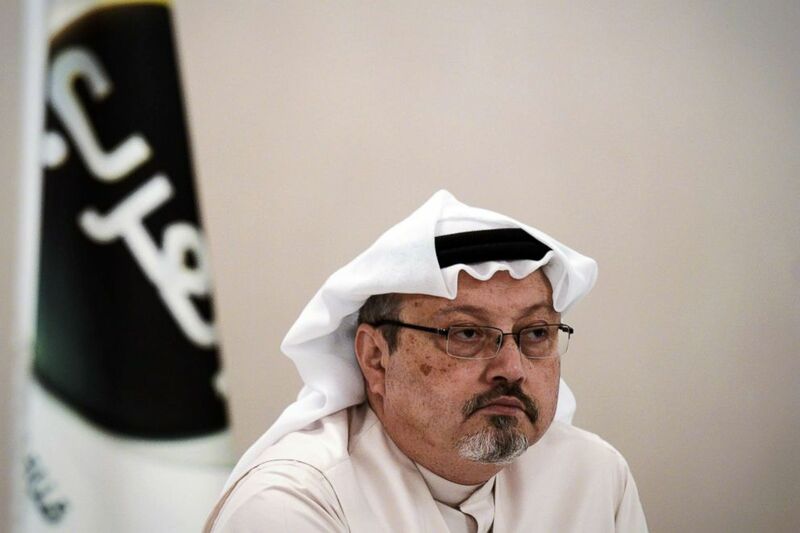 (Niganned al-Shaikh/AFP/Getty Images) A general manager of Alarab TV, Jamal Khashoggi, looks on during a press conference in the Bahraini capital Manama, Dec. 15, 2014. Instead of Haspel last week, members heard from Secretary of State Mike Pompeo and Defense Secretary Jim Mattis, both of whom said afterward that there's no "direct" evidence tying Saudi Prince Mohammed bin Salman, or MBS as he is known, to Khashoggi, this despite a CIA assessment that reportedly concludes that MBS likely ordered the killing. Chairman Corker said he thinks the "vast majority" of senators believe the CIA assessment and are poised to act legislatively to punish the young crown prince. A number of senators are looking at advancing a bipartisan War Power Resolution seeking to withdraw U.S. military support for the Saudi-led coalition in Yemen as a way to send a signal to the kingdom. Corker said the measure could be taken up by the Senate as early as Thursday, but he said he thought Monday was more likely, buying more time for Senate leaders to figure out how the debate will unfold. The chairman said he remains concerned that the measure could potentially have unintended consequences, and he is looking at "how do we end up at a place -in the end- where we've done something good for our country?" Sen. John Cornyn, R-TX, for his part, said he doesn't see a need for the CIA briefing Tuesday, adding, "(Haspel) doesn't have access to any intelligence that Pompeo and Mattis don't have- in other words, they have access to the same thing, so I'm not exactly sure what purpose this serves." President Trump has cast doubt on the CIA assessment and issued unwavering support for the Saudis in an extraordinary statement last week.